Org. Biomol. Chem. 2014, 12, 7018-7025. 35. "Natural Tetraponerines: A general Synthesis and Antiproliferative Activity." J. Org. Chem. 2014, 79, 3982-3991. 34. "Regio- and Stereoselective Aminopentadienylation of Carbonyl Compounds." J. Org. Chem. 2014, 79, 1796-1804. 33. "A general protocol to afford enantioenriched linear homoprenylic amines." Org. Biomol. Chem. 2013, 11, 7507-7515. 32. "Diastereoselective Allylation of Carbonyl Compounds and Imines: Application to the Synthesis of Natural Products." 31. "Concise Total Synthesis and Stereochemical Analysis of Tetraponerines T3 and T4"
Bosque, I.; Gonzalez-Gomez, J.C.;* Guijarro, A.;* Foubelo, F.; Yus, M.
J. Org. Chem. 2012, 77, 10340-10346. 30. "Enantioselective synthesis of cis- and trans-2-methyl-6-nonylpiperidines: alkaloids solenopsin and isosolenopsin"
Medjahdi, M.; González-Gómez, J. C.; Foubelo, F.; Yus, M.
29. "Straightforward Access to Enantioenriched 2-Allylpiperidine: Application to the Synthesis of Alkaloids"
Bosque, I.; Gonzalez-Gomez, J.C.;* Foubelo, F.*; Yus, M.
J. Org. Chem. 2012, 77, 780-784. 28. "Preparation of Enantioenriched Homoallylic Primary Amines"
González-Gómez, J. C.; Foubelo, F.; Yus, M.
27. "Catalytic Enantioselective Allylation of Carbonyl Compounds and Imines"
26. "Concise Route of (-)- and (+)-Aphanorphine"
Medjahdi, M.; González-Gómez, J. C.;* Foubelo, F.;* Yus, M.
25. "Stereoselective α-Aminoallylation of Aldehydes with Chiral tert-Butanesulfinamides and Allyl Bromides"
González-Gómez, J. C.;* Medjahdi, M.; Foubelo, F.;* Yus, M.
J. Org. Chem. 2010, 75, 6308-6311. 24. "Efficiency in chemistry: From hydrogen autotransfer to multicomponent catalysis" (Special Issue). Alonso, F.; Foubelo, F.; González-Gómez, J. C.; Martínez, R.; Ramón, D. J.; Riente, P.; Yus, M.
23. "Pyridazinopsoralens of wide chemotherapeutic interest"
Dalla-Via, L.; Gia, O.; Marciani-Magno, S.; Braga, A.; González-Gómez, J. C.; Pérez-Montoto, L. G.; Uriarte, E.
Bioorg. Med. Chem. 2010, 18, 5708-5714. 22. 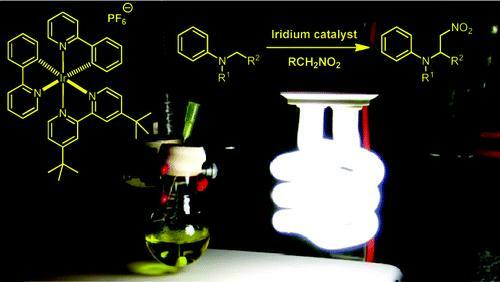 "Visible-Light Photoredox Catalysis: Aza-Henry Reactions via C-H Functionalization"